Current guidelines identify people with chronic kidney disease (CKD) as being at high risk for cardiovascular and all-cause mortality. Because as many as 19 million Americans may have CKD, a comprehensive summary of this risk would be potentially useful for planning public health policy. A systematic review of the association between non–dialysis-dependent CKD and the risk for all-cause and cardiovascular mortality was conducted. Patient- and study-related characteristics that influenced the magnitude of these associations also were investigated. MEDLINE and EMBASE databases were searched, and reference lists through December 2004 were consulted. Authors of 10 primary studies provided additional data. Cohort studies or cohort analyses of randomized, controlled trials that compared mortality between those with and without chronically reduced kidney function were included. Studies were excluded from review when participants were followed for <1 yr or had ESRD. Two reviewers independently extracted data on study setting, quality, participant and renal function characteristics, and outcomes. Thirty-nine studies that followed a total of 1,371,990 participants were reviewed. The unadjusted relative risk for mortality in participants with reduced kidney function compared with those without ranged from 0.94 to 5.0 and was significantly more than 1.0 in 93% of cohorts. Among the 16 studies that provided suitable data, the absolute risk for death increased exponentially with decreasing renal function. Fourteen cohorts described the risk for mortality from reduced kidney function, after adjustment for other established risk factors. Although adjusted relative hazards were consistently lower than unadjusted relative risks (median reduction 17%), they remained significantly more than 1.0 in 71% of cohorts. This review supports current guidelines that identify individuals with CKD as being at high risk for cardiovascular mortality. Determining which interventions best offset this risk remains a health priority. It has been known for many years that ESRD is associated with very high mortality and accelerated cardiovascular disease (1). Several recent studies suggest that the risk for death is increased independently in individuals who have less severe impairment of kidney function and are not dialysis dependent, compared with those who have preserved kidney function (2,3). However, other rigorously conducted studies have found little or no significant increase in all-cause or cardiovascular mortality in the setting of mild to moderate chronic kidney disease (CKD) (4,5). Even among studies that have demonstrated higher mortality rates in people with CKD, the magnitude of the increased risk has varied substantially for reasons that are unclear. Current guidelines identify individuals with CKD as being at high risk for cardiovascular disease and other adverse outcomes (6). Because non–dialysis-dependent CKD may affect as many as 19 million Americans (7), a summary of the risk for all-cause and cardiovascular mortality associated with this condition potentially would be useful to decision-makers and researchers. In addition, identification of factors that modify the strength of the relation between CKD and adverse outcomes may help to improve the current understanding of how impaired kidney function leads to higher risk. Despite considerable interest in this topic, previous summaries of the available evidence have been presented predominantly as narrative reviews, which have widely known limitations (8,9). Therefore, we conducted a systematic review to evaluate the association between non–dialysis-dependent CKD and the risk for all-cause and cardiovascular mortality. We also sought to determine patient- and study-related characteristics that influenced the magnitude of these associations. Two reviewers searched Medline (1969 to 2004) and EMBASE (1988 to 2004) and the reference lists of primary studies, review articles, and clinical practice guidelines independently and in duplicate. The search strategies were created with the assistance of a research librarian and were not restricted to the English language (Appendixes A and B). Any study that was deemed potentially relevant by one or more reviewers was retrieved for inspection. The search strategy and data extraction were defined by a prospective protocol. Studies were eligible for inclusion when they studied adults and contained data that permitted comparison of long-term (>1 yr) cardiovascular mortality or all-cause mortality between those with and without kidney disease (defined by abnormal GFR, creatinine clearance [CrCl], or serum creatinine [SCr] levels). Studies were excluded when they were published in abstract only, included data from patients with acute renal failure (or included people who were at high risk for acute renal failure, e.g., those with acute myocardial infarction), or included patients who had ESRD and were on dialysis or received a renal transplant. Finally, meta-analyses, case-control studies, studies with <100 subjects, studies without a contemporaneous control group drawn from the same population, and studies that did not report the outcomes of interest were excluded. We assessed criteria that can influence study validity (10). A study was described as retrospective when the initiation of the study occurred after both the exposures and the outcomes of interest occurred (11). When multiple publications from the same group were found, the studies were reviewed carefully to ensure that no data were analyzed in duplicate. Data were extracted into a database and checked for accuracy by a second reviewer. When data were reported in strata, the data were extracted as separate cohorts. The following data were extracted from each included study: design, definition of CKD, age, gender, baseline renal function, clinical subpopulation (heart failure, known cardiovascular disease, hypertension, general population, and other), cardiovascular risk factors other than CKD (hypertension, smoking, diabetes, BP, LDL cholesterol, and body mass index), proteinuria, medication use (angiotensin-converting enzyme inhibitors, aspirin, β blockers, and statins), and mortality (all-cause and cardiovascular). When included studies did not report data that permitted construction of a two-by-two table (mortality by CKD status), additional information was requested from the authors. When possible, we used estimates of kidney function that were derived from estimating equations that are based on SCr, age, and/or race and gender rather than SCr alone. We defined CKD as present when estimated CrCl or GFR was <60 ml/min (with or without standardization to body surface area) or when SCr was >120 μmol/L (>1.3 mg/dl) when data from estimating equations were unavailable. Although not all studies presented results in this form, we used values as close as possible to these levels of kidney function. Although CrCl is conceptually different from GFR, it is commonly used as an estimate of GFR (6); therefore, CrCl was used interchangeably with GFR to assess the primary outcome. Similarly, estimates of GFR and/or CrCl that were normalized to body surface area were pooled with those that were not. We considered the outcomes of all-cause death and cardiovascular death. For the latter, we used the definitions that were used by the authors of the primary studies; these typically included death from coronary, noncoronary cardiac, and cerebrovascular causes. Overall summary estimates of the relation between CKD and these outcomes are not presented because of the extensive clinical and methodologic heterogeneity. However, pooled estimates are presented for the clinical subpopulations (heart failure, known cardiovascular disease, hypertension, general population, and other). Because of the differing definitions of kidney function and CKD between studies, we decided to dichotomize kidney function, using a GFR threshold as close as possible to 60 ml/min as mentioned above. We calculated unadjusted risk ratios (RR) from the raw data to facilitate comparisons between studies. These latter results then were pooled using a random-effects model (12). For comparison, we also extracted adjusted hazard ratios from Cox regression analyses (which was the analysis that most studies reported) when available. To facilitate comparisons with unadjusted results, we included in our analysis only adjusted hazard ratios that were based on dichotomization of GFR, meaning that we did not report adjusted estimates from studies that categorized GFR into more than two categories (2,13–18) or treated GFR as a continuous variable (19–25). Reasons for diversity in study results were explored using meta-regression. The association between the following factors and outcomes was considered at the study level: mean age; proportion of patients who were female; average duration of follow-up; population (hypertensive, heart failure, cardiovascular disease, or from the general population); proportion of patients who were hypertensive or current smokers or had diabetes or a family history of coronary disease; mean baseline renal function, BP, total cholesterol, body mass index, proteinuria, and C-reactive protein; and medication use. Medication use, proteinuria, and C-reactive protein were not analyzed further because too few studies reported these data. Methodologic factors (10) (e.g., study design) and the definition of CKD also were explored as potential explanatory variables in meta-regression. For each meta-regression, only studies for which the factor of interest was available were included in the analysis. The models were fit using the step-wise selection method. Statistical heterogeneity was assessed using the I2 statistic (26,27) and the χ2 test for heterogeneity. I2 is the percentage of variance that is due to between-study variance. A permutation test was applied to all fitted models to guard against spurious findings (28). Publication bias was not assessed because of the extensive statistical heterogeneity, since covariates that lead to heterogeneity of the relation between exposure and outcome also may lead to funnel plot asymmetry (29). Data from the studies that presented results for subgroups of patients with renal insufficiency (e.g., GFR 30 to 59.9 and 15 to 29.9 ml/min) were included in additional analyses that examined the graded relation between severity of renal dysfunction and mortality. In these analyses, the level of renal dysfunction in each subgroup was categorized by substituting the midpoint of the range for interval data and adding or subtracting 15 ml/min from bounded data. Therefore, in these analyses, each study might contribute one estimate of risk (mortality associated with GFR <60 ml/min) or multiple estimates of risk (mortality associated with 30 to 59.9 and 15 to 29.9 ml/min, respectively). We used a random intercept logistic regression model (30) to control for the possibility of within-study nonindependence, with mortality as the dependent variable and the index of renal function (estimated GFR in ml/min) as the independent variable. Confidence intervals (CI) for the best fit lines were calculated using the parameter estimates and the estimated covariance structure from the fitted model. Statistical analyses were performed with Stata 8.2 (31), S-Plus 7.0 (32), and Review Manager 4.2.7 (33). Statistical significance was set at P < 0.05 for all analyses. This report was structured in accordance with published guidelines (34) and was approved by the institutional review board at the University of Alberta. Our search retrieved 3114 citations. Of these, 232 full-text articles were retrieved, and 39 studies with a total of 1,371,990 patients (2–5,13–25,35–56) met our criteria for review (Table 1). Reasons for study exclusion are presented in Figure 1: Six studies were duplicate publications, and five studies (57–61) did not report or subsequently provide data in a usable format. Flow diagram of studies that were considered for inclusion. Seventeen of the 39 studies were nested cohort analyses of randomized, controlled trials. Of the remaining 22 cohort studies, seven were retrospective. Details of the 39 studies are outlined in Table 1. The sample selection process and the prognostic variable were described adequately in 100% of the studies. As well, most (97%) described the inclusion and exclusion criteria adequately. Other quality items such as the description of clinical and demographic characteristics, the description of outcomes, and adjustment for important prognostic factors were adequate in 74 to 90% of the studies. In all studies, the definition of CKD seemed to be based on a single measurement of SCr. One study (50) reported re-analyzing the baseline SCr measurement when the value exceeded 5.0 mg/dl, although repeat blood sampling seems not to have been performed. The number of patients who were lost to follow-up was reported in 67% of the studies. Of these, 81% of studies lost <10% of patients during their follow-up. Median follow-up for the included studies was 4.5 yr (range 0.8 to 16). Forty-one cohorts from 37 studies that included 1,366,126 patients reported or provided all-cause mortality by CKD status. 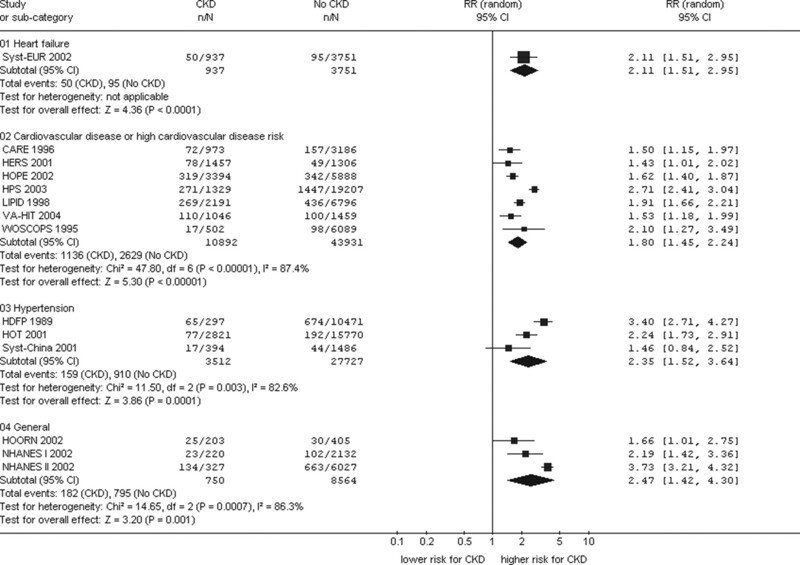 The unadjusted relative risk for mortality in patients with CKD compared with those without CKD ranged from 0.94 to 5.0 and was significantly more than 1.0 in 38 (93%) of 41 cohorts. The I2 statistic was >99% (Q = 6907, P < 0.001), indicating statistical heterogeneity between studies, and visual inspection of the forest plots demonstrated qualitative heterogeneity, suggesting that presenting a pooled estimate of the overall risk associated with CKD would be inappropriate. Within clinical subpopulations, statistical heterogeneity remained, but qualitative heterogeneity was much reduced, suggesting that pooling would be informative. Therefore, pooled relative risks in various subpopulations are presented in Figure 2. All-cause mortality in chronic kidney disease (CKD). We performed additional analyses to determine factors that might partially explain this heterogeneity. Twenty-four variables were explored in meta-regression. In several meta-regression models, studies with the following characteristics tended to find a higher relative risk for mortality associated with CKD: Lower risk patients (younger mean age, higher proportion of women, less hypertension at baseline, and subjects from the general population rather than those with known heart failure or cardiovascular disease), poorer quality studies (retrospective studies, shorter follow-up duration, and studies not reporting loss to follow-up), studies with a representative sample of participants (acceptable external validity), and cohort studies (as opposed to nested cohort analyses of randomized trials). In the final multivariable meta-regression model (31 cohorts), the predicted relative risk for death associated with CKD was significantly higher in retrospective trials, cohorts with younger average participant age, and those in which patients had lower baseline prevalence of known cardiovascular disease (all P < 0.05). Adjustment for these three covariates only marginally reduced I2 from >99 to 88% (Q statistic reduced from 6787 to 227). All permutation tests were significant, supporting these variables as contributors to the heterogeneity in the risk associated with CKD as reported by the primary studies. To examine the graded relation between severity of CKD and mortality, we calculated multiple risks per study for various severities of renal dysfunction (expressed as the frequency of death within each stratum of renal dysfunction). Sixteen prospective studies stratified results by estimated GFR at baseline and so were available for this analysis. We found an exponential relation between the severity of renal dysfunction and the risk for all-cause mortality (Figure 3). For example, the predicted risk for death during the median follow-up of 4.9 yr was 12% (95% CI 8 to 19) when CKD was defined as estimated GFR = 80 ml/min, 17% (95% CI 11 to 25) for GFR = 60 ml/min, and 25% (95% CI 17 to 35) for GFR = 40 ml/min. Phrased in relative terms, the estimated relative odds for death associated with GFR of 80, 60, and 40 ml/min were 1.9, 2.6, and 4.4, respectively (all compared with a GFR of 100 ml/min). All-cause mortality in CKD by baseline renal function. 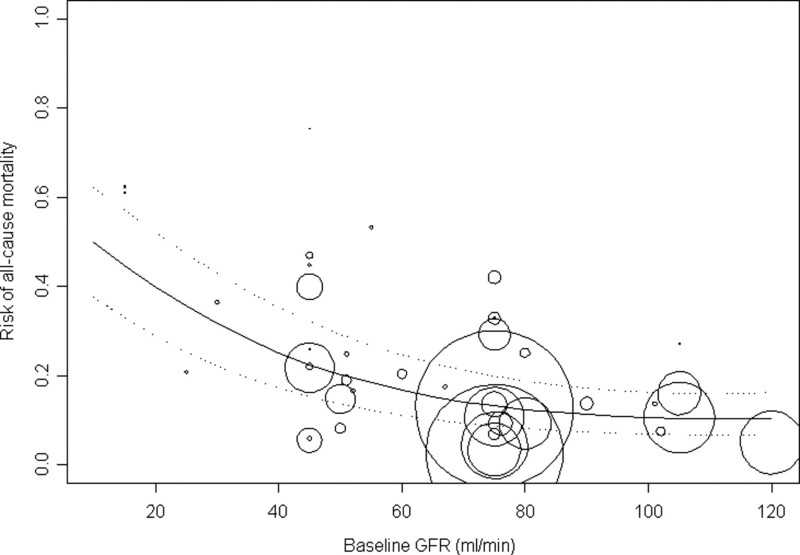 Risk for all-cause mortality in 42 cohorts according to baseline estimated GFR (ml/min). Risks are expressed as proportions (e.g., 0.6 = 60%). The area of each circle (i.e., data point) is proportional to the sample size of each cohort. The center line models the estimated risk for baseline GFR from the unadjusted analysis. Dotted lines represent the 95% confidence intervals. Median follow-up is 4.9 yr (range 0.8 to 14 yr). Twenty-six analyses (from 23 studies) performed and reported Cox regression models using kidney function as an independent variable and all-cause mortality as the dependent variable, adjusted for potential confounders. In total, >100 different covariates were considered for inclusion in the individual studies. Of these, only four variables (age, BP or hypertension, diabetes, and gender) were considered in at least half of these analyses. The adjusted hazard ratios for 13 of 14 analyses that treated CKD as a dichotomous variable (Figure 4) all were lower in magnitude than the unadjusted relative risks (median reduction 17% lower; range 27% increase to 52% lower), consistent with the observation that CKD frequently coexists with other risk factors for death, such as diabetes and hypertension. Ten of the 14 adjusted estimates were statistically significant. All-cause mortality in CKD using adjusted hazard ratios. Fourteen studies that included a total of 100,064 participants reported cardiovascular mortality. The unadjusted relative risk for mortality was qualitatively increased in patients with renal insufficiency and ranged from 1.4 to 3.7 (Figure 5). There was substantial heterogeneity between the studies; results were not mathematically pooled (Q = 127, P < 0.001; I2 90%). Meta-regression found that the risk associated with CKD was significantly higher in cohorts with lower mean age. After adjustment for mean age, we found that I2 reduced from 91 to 74% (Q reduced from 127 to 43, all P < 0.001), and the permutation test was statistically significant. No further covariates were statistically significant. Using a mean age of 50 yr, our model predicted a relative risk of 3.4 (95% CI 2.1 to 5.5) with renal insufficiency, whereas with a mean age of 70 yr, the relative risk was 1.5 (95% CI 0.96 to 2.3). Five of the seven adjusted hazard ratios for cardiovascular mortality were statistically significant. Four of five adjusted estimates were lower in magnitude than the unadjusted relative risks (median reduction 20% lower; range 13% increase to 29% lower). To our knowledge, this is the first systematic review to examine the relation between non–dialysis-dependent CKD and mortality in multiple patient populations. The point estimate for the unadjusted relative risk for all-cause death associated with CKD exceeded 1.0 for 40 of 41 cohorts and was statistically significant in 38 (93%) of 41. The absolute risk for death increased exponentially with decreasing renal function in these studies. The magnitude of the unadjusted increase in risk ranged from approximately 38% to >1100%, reflecting considerable between-study heterogeneity. However it is important to emphasize that this heterogeneity was quantitative, not qualitative. Therefore, although the point estimates varied across studies, CKD was associated consistently with increased all-cause and cardiovascular mortality in a wide range of clinical populations. In the 14 studies that adjusted these risks for other patient factors such as diabetes and hypertension, the risks were substantially lower than unadjusted risks. This reflects that CKD often coexists with other factors that are associated with adverse outcomes. The increased risk for all-cause mortality largely was driven by cardiovascular deaths, which constituted 58% of the deaths in the 13 studies that reported both cardiovascular and all-cause deaths. The magnitude of the increased risk associated with CKD was greater with more advanced kidney dysfunction, suggesting that different definitions of CKD between studies may have explained some of the observed heterogeneity. Although differences in comorbidities between studies did not seem to explain all the variation in the quantitative estimates of increased risk associated with CKD, this conclusion should be interpreted with caution given that most studies did not account for all potential confounders. Multivariable meta-regression suggested that the relative risk for death associated with CKD was significantly higher in lower risk populations, such as those with younger participants or with a lower prevalence of cardiovascular disease. These findings contrast with previous suggestions that the risk as a result of CKD might be limited to those with preexisting vascular disease (62) but are consistent with data from the United States Renal Data System indicating that the relative risk for cardiovascular death in dialysis patients (versus the general population) is greater in younger patients (1). From a population health perspective, this might suggest that screening for CKD should focus on younger, healthier populations to maximize the impact of preventive strategies. Unfortunately, this benefit would need to be balanced against the much lower likelihood of detecting CKD in such populations. Although the mechanisms by which CKD might mediate increased risk for death is unknown, there are several possibilities. First, CKD often coexists with other cardiovascular risk factors, including dyslipidemia, hypertension, smoking, and diabetes (63), and these risk factors are associated with substantial increases in absolute risk in the general population (64–67). Second, patients with evidence of renal disease are less likely to receive proven efficacious therapies (23,68–70). In addition, it is possible that therapies that are proved to be efficacious in trials with few CKD patients might be less efficacious or more toxic in the setting of CKD. Third, impaired kidney function may be a marker merely for severity of vascular disease, including atherosclerosis that is not yet clinically evident (62,71). Finally, impaired kidney function is associated with markers of inflammation and other putative risk factors for cardiovascular events (72–75), which might contribute directly to adverse outcomes. As with all systematic reviews, the strength of our conclusions is influenced by the quality of the constituent studies, and analysis of aggregate (study-level) data may have concealed subgroup effects that would have been apparent if subject-level data were available. We assessed study quality using a standard instrument with 10 domains (10) and found that between 67 and 100% of studies met at least eight of the 10 quality criteria. Most studies were not conducted in a sample that was broadly representative of the population that they sought to investigate, and only a minority reported reasons for losses to follow-up. Because our primary interest was in CKD, we excluded results from studies in which acute renal failure seemed likely, such as those that were conducted in participants with acute coronary syndromes. However, all studies in this report defined CKD on the basis of a single measurement of kidney function; therefore, some individuals may have been misclassified with respect to CKD status. This suggests that the true relation between CKD and death is stronger than that suggested by our results (because misclassification would bias our results toward the null for finding any association ). Future studies should classify individuals on the basis of multiple measurements of kidney function, preferably with temporal separation to confirm chronicity. In addition, it is plausible that more rapid rates of kidney function loss are associated with adverse outcomes, and future studies should test this hypothesis. Finally, because proteinuria is strongly associated with the risk for cardiovascular events (a relation that is independent of reduced GFR) (77), future studies should report the association between CKD and risk in strata that are defined by urinary protein excretion. Non–dialysis-dependent CKD was associated with an increased risk for all-cause and cardiovascular death in the majority of studies. This finding remained after within-study adjustment for potential confounders and was consistent across studies despite variations in design, study populations, event rates in control subjects, and definitions of CKD. This review supports current guidelines that identify individuals with CKD as being at high risk for cardiovascular disease and other adverse outcomes and supports calls for more intensive intervention in patients with CKD to prevent adverse outcomes (78). Therapeutic strategies that have been shown to prevent cardiovascular events in patients with CKD include aggressive BP control, statins, and angiotensin-converting enzyme inhibitors/angiotensin receptor blockers (79). The first step in addressing any care gap is identifying and quantifying the magnitude of the problem; our systematic review achieves this goal by highlighting the consistency of the evidence about the hazards that are associated with CKD. The challenge that clinicians now face is to search for CKD and manage it aggressively. The challenge that researchers now face is to evaluate novel means of detecting CKD (80) and to expand the therapeutic armamentarium for patients with CKD. This study was supported by the Alberta Kidney Disease Network. M.T. and F.M. were supported by Population Health Investigator Awards from the Alberta Heritage Foundation for Medical Research and New Investigator Awards from the Canadian Institutes for Health Research. M.F. was supported by a summer studentship from the Canadian Institutes for Health Research. A.X.G. was supported by a Clinician Scientist Award from the Canadian Institutes for Health Research. We thank the following authors for sending us additional data: Graziella Bruno, Rory Collins, Justin Ezekowitz, Alan Go, Jose Marie Moreno Planas, Giovanni Pulignano, Jorg Muntwyler, Giuseppe Schillaci, Michael Shlipak, and Susanna Sihvonen. We also thank Kris Cramer for data checking and Alex Stewart and Julie Paterson for text retrieval. This study links an increased tendency for uric acid stone formation to type II diabetes and postulates that the association relates to the reduced urine pH seen in type II diabetics with insulin resistance. In the companion issue of CJASN, Musso et al. present a more comprehensive review of all the established renal manifestations of insulin resistance in metabolic syndrome and type II diabetes (pages 616–622). Moving Beyond Angiotensin II to Also Target Aldosterone?